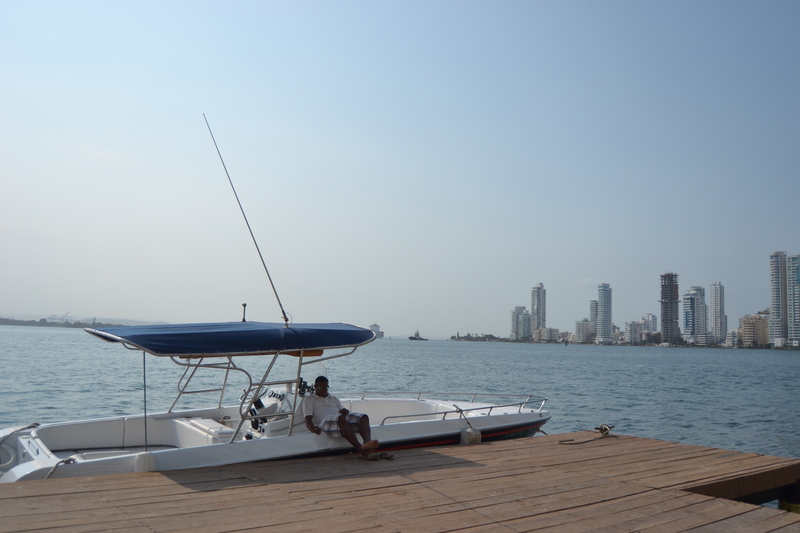 Cartagena, Colombia is best known as a vacation destination and has a reputation for having a relaxed atmosphere and a “laid-back” populace*. 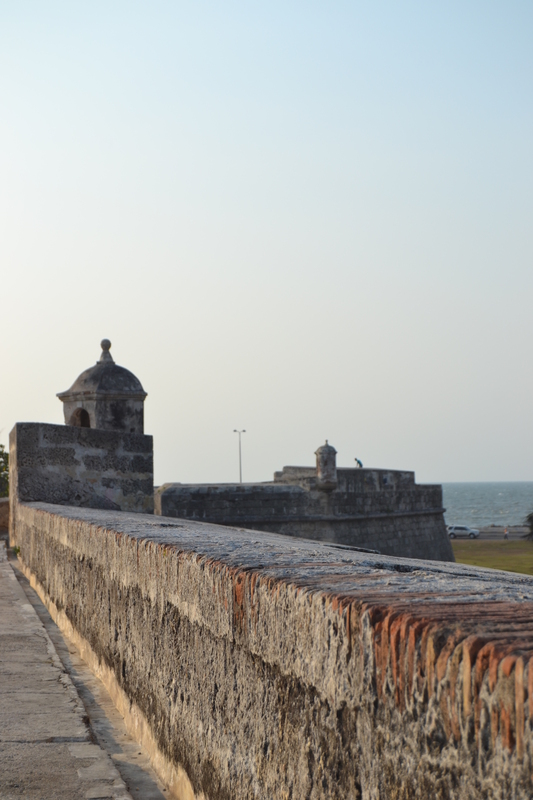 While “Chillax, it’s Cartagena!” isn’t the official slogan, for most visitors, it might as well be**. For the most part, this is true. The hot, sticky days tend to encourage languid afternoons while the evening breezes are a perfect complement to the sound of rolling waves, and make evenings out much more enjoyable. But Cartagena isn’t all play.. 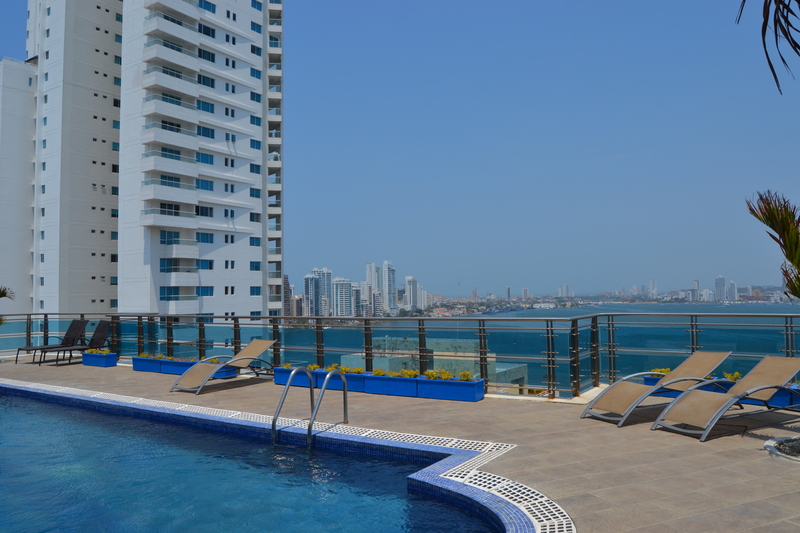 While it may not have the reputation as the center of business and industry for the Caribbean Coastal region (à la Barranquilla), there’s more to Cartagena than tourism. 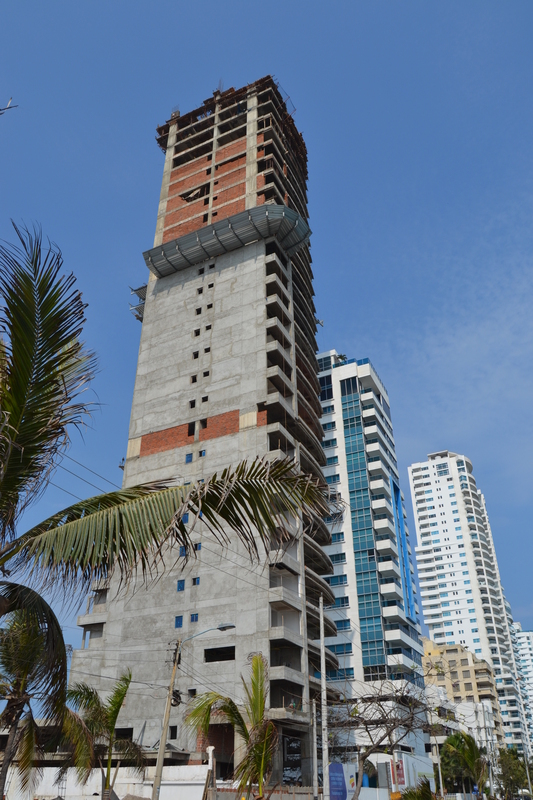 While this sector drives the creation of several new high-rise hotels and luxury apartments, the economy of Cartagena is supported by more than visitors enjoyment of the sand, sun and sea. 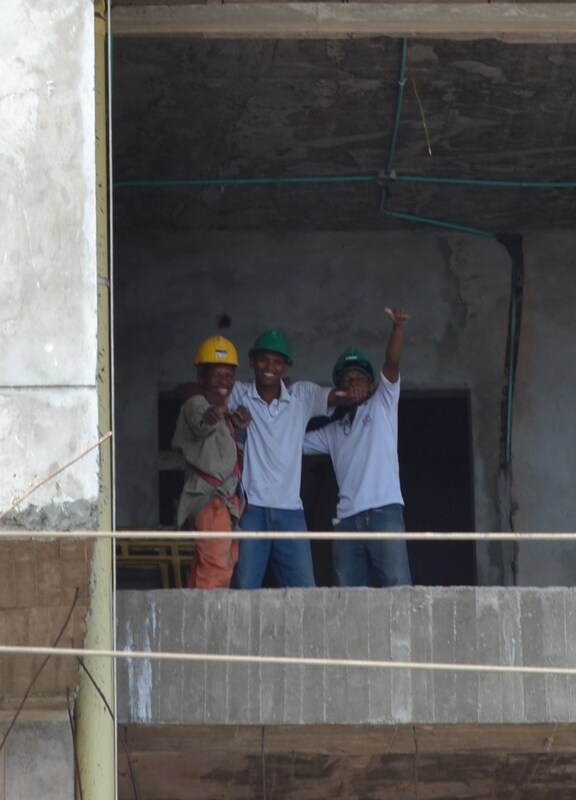 Construction workers on a high rise take a quick moment to say hello to yours truly. 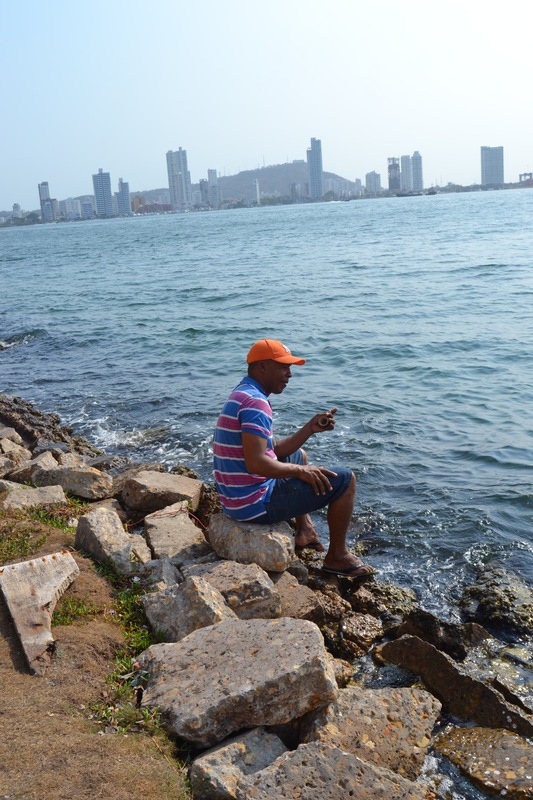 Just beyond the ongoing construction and ever-changing skyline of the barrios of Bocagrande and Castillogrande is the port of Cartagena. While the history of the port itself is interesting enough – with tales of Spanish exploration and exploitation as well as swashbuckling pirates, slave auctions and all the elements of an action-packed tale, the modern-day port remains alive and active. Contrary to popular belief, the port is more than a cruise ship dock. The modern port terminal opened in 1934, and has alternated between private (corporate) and governmental control. Since 1993, the port has been managed by the Cartagena Regional Port Society, a private entity. As of 2005, this has included the separate terminal for shipping containers. Unlike the convention center, with its picturesque tall ships, for the most part, Cartagena is a working port – filled with industrial machinery, international trade vessels and a large mountain of metal shipping containers. There are also a number of fishing boats, boats for sightseeing and travel to nearby islands, as well as the previously mentioned cruise ships. At any given time, multiple boats of all shapes and sizes are visible within the sheltered bay. 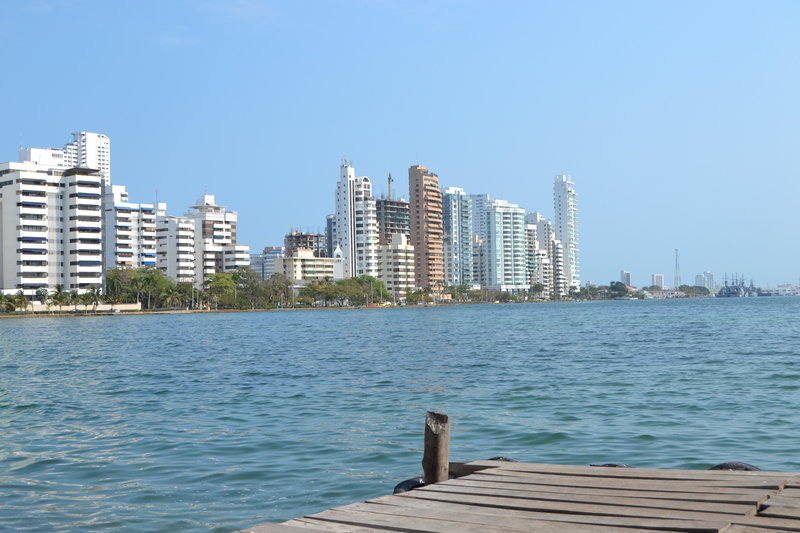 While Colombia has several ports due to the nation’s extensive coastlines on both the Caribbean and Pacific seas, Cartagena is Colombia’s main port for shipping containers. The port is a 24/7 operation, 365 days a year. According to information provided by the society, over 1600 vessels pass thru the port each year. While this number isn’t comparable to other ports, in larger countries such as the massive Port of Los Angeles, the port reports annual traffic of “including 975 container ships, 220 cruise ships, 380 breakbulk carriers, and 11 bulk carriers” which included almost two and a half million tons of cargo. That’s more than just a pretty face.. While popular media such as films and romance novels often focus on the infamous Port Royal in Jamaica as a center of operations for privateers, buccaneers, corsairs and plain-old pirates, Cartagena was one of the most frequent targets of this motley assortment of (often secretly supported by their sovereigns) of seafaring crews. Jean – Francois Roberval – pirate, attacked Cartagena in 1544. 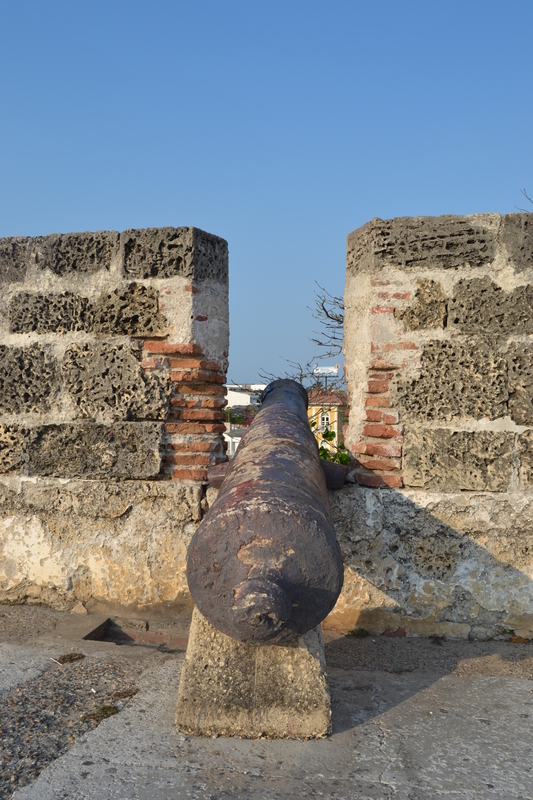 Travel blog with tips about historical sites, and pirate history of Cartagena. Sir Francis Drake – Famed English explorer, vice-admiral of the British Navy and Privateer (a pirate sanctioned by the British government, in this case, Queen Elizabeth I). “Letters of marque” were issued to British captains to encourage the capture, sinking, plundering and other harassment of Spanish vessels and holdings. Sir Francis Drake did a particularly good job of it – from coastal Virginia, Florida, and through out the Caribbean, including the wealthy seaport of Cartagena. There’s a quite comical YouTube video about Sir Francis Drake’s excursions into Cartagena (it sounds like Jan Brady as a teenager is narrating). – Cali, Colombia has a festive party reputation as the lively home of salsa dancing. ** I apologize the Cartagena residents.. “Chillax.. it’s Cartagena” is my own literary invention. 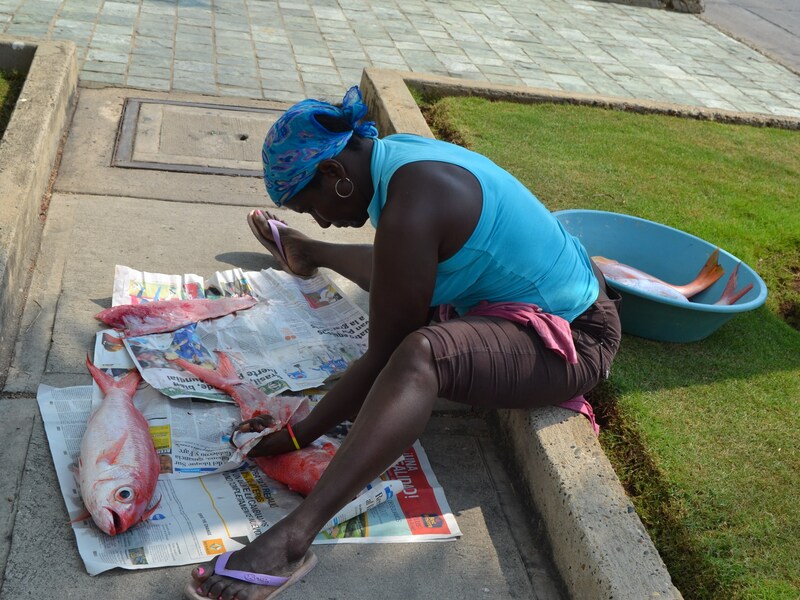 Cartagena residents are much more suave than my out-dated phrase suggests. 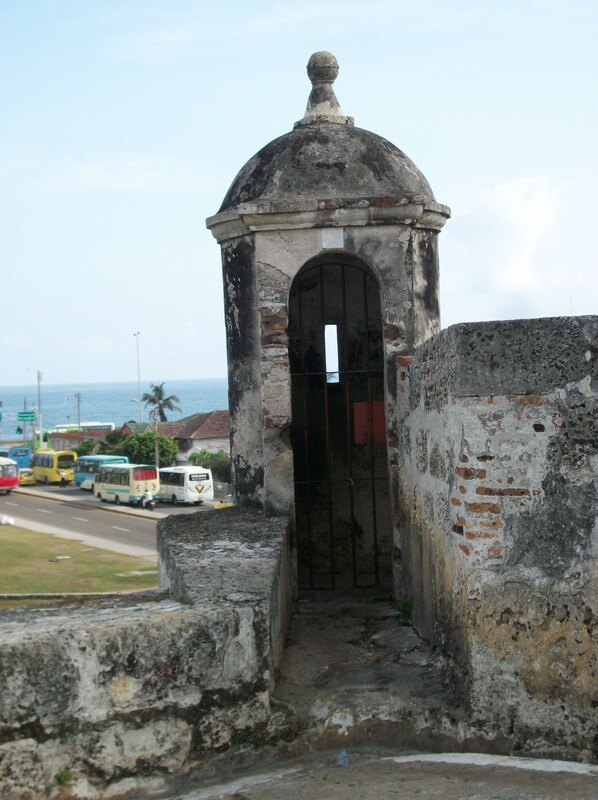 This entry was posted in Cartagena Life and tagged Bocagrande, Castillogrande, Images of Cartagena, Pirates of the Caribbean, Puerta Cartagena. Bookmark the permalink.